JP Morgan Chase released a summary of its operating results a few weeks ago and they ought to be the envy of the town. The report can be accessed via JPM's Investor Relations website, and the below are some of the highlights that are particularly interesting and relevant to Community and Regional Bank executives. 23% ROE driven by aggressive cross-sale results, and very manageable attrition rate (which has improved significantly in 2013!). The results where achieved, in part, based on focus on Strategic Marketing, Cost Optimization, Process Automation, and converting operating model to Digital Interaction focus. 20%+ ROE results are indeed possible in this "new normal" era. Cross-selling is very much alive, and the 8 Products per Household seems like a pretty good goal for Community and Regional Banks. Especially given that most Community and Regional Banks claim better customer service, stronger customer relationships and deeper customer knowledge. Product fit based on customer segmentations utilizing Strategic Marketing. Product and process simplification - to borrow Brett King's words: 'Remove the friction' from the process; eliminate complexity for the customer. Meet customer demand for anywhere, anytime anyway interaction by refocusing resources to digital channels. Institute strong cost management program by eliminating redundant and under-used capabilities, and consolidating systems, processes, and facilities. It is no secret that the theme of the past 5 years has been digital. But the extent of the shift may surprise many. Teller Transactions keep falling despite an increase in the number of customers and the growth of products per household customer. The decline in teller transactions is offset by more than 25% growth in digital use. This is made even more evident by JPM indicating that 53% of total deposits were made utilizing one of the digital channels - a 5x increase in just the past 6 years. More interesting, is the graph on the far right that shows that for every 100 branch visits there are 92 visit to the ATM, 76 online and 55 mobile log-ins. Taken together, there are 223 virtual interactions for every 100 branch visits! This indicator, as well as the spike in mobile activity, helps to explain the focus on Digital channels at JPM. Retail Banking, and especially the basic day to day transactions are quickly migrating to digital channels. This trend is being driven by customer demand, despite the reticence of so many Bankers. Digital is the natural home for the vast majority of day to day activity. It's catch up time if your bank is not conducting at least 50% of its transactions via purely digital channels. Next year, the benchmark is likely to be 75% of day to day transactions. Much has been said and written about the scope of Branch growth at JPM, and is it turns out, those who claim significant Branch growth at JPM are just plain wrong. 2011 and 2012 were characterized by Branch expansion in high-value geographies including Los Angeles, Miami, and San Francisco that have "significant opportunities for Affluent and Business Banking." With these networks built out, JPM added 16 net new Branches in 2013 (that's on a base of 5,600 branches) and it projects 0 (ZERO) net new Branches in 2014 and 2015! The reasons for this are many, not the least of which is the fact that consumers are abandoning Branches as a channel for sales & service. 26% of JPM's Retail Bank customers visit a Branch less often than once per quarter (many never set foot in the branch), and 74% visit a Branch not more often than once per month. If your plans for 2014 and beyond include opening a new branch, upgrading a branch or any other branch related activity (other than Branch closure) then you owe it to your customers and your shareholders to stop those plans immediately. No one (other than your staff and your landlord, the architect, a branch marketing vendors) want anything to do with a Branch. It generates zero value for the consumer, and it represents more than 60% of your total cost base. Yes, you will need facilities to house your staff and your Sales team, but these facilities ought not be the street-level traditional Bank Branch facility. We've all heard much about the "Branch of the Future." 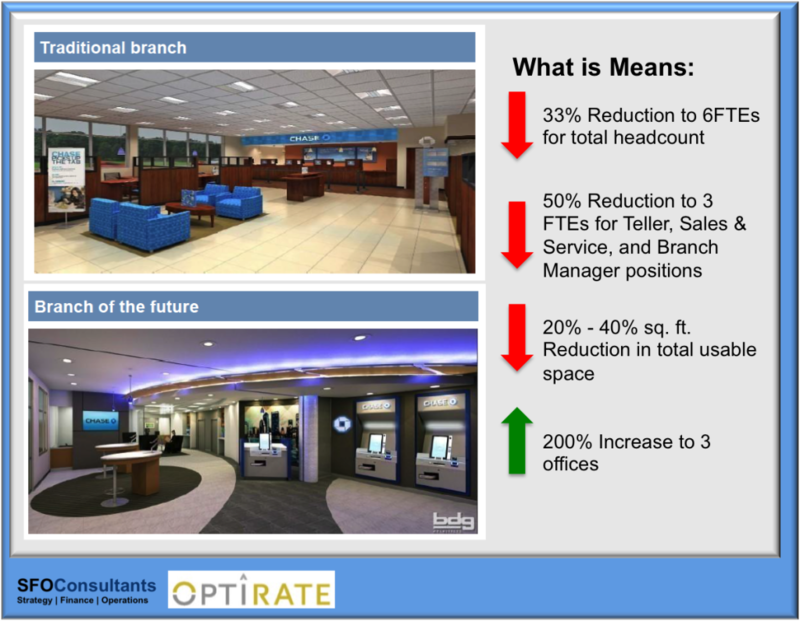 At least according to JPM, the "Branch of the Future" has more in-branch ATMs, and more large display screens. The "Branch of the Future" also has fewer employees - a total of 6 staff down from the current levels of 9 - 10 employees. And most telling, the "Branch of the Future" has just 3 Teller / Branch Manager positions. The remaining 3 staff roles are Sales driven positions including Lending Officers, Business Banking Relationship Managers, and Financial Advisors. It turns out that the "Branch of the Future" is code word, at least for JPM, for a focus on selling. The key 'Aha!' here is that Branches for JPM are ALL about selling! The second 'Aha!' for Community Banks and Regional Banks is that your selling occurs at the (current or prospective) customer site, thus no need for a traditional Branch or "Branch of the Future". The third 'Aha!' is to recognize that your Community Bank or Regional Bank cannot complete with JPM or any of the other top 100 Banks based on physical premise opulence or its convenience. The good news is that most customers don't and won't care! What they care about is 'Where's The Beef!' ... and the 'Beef' is all about product fit and value creation for the customer. JPM's report provides a wealth of insight for Community Banks and Regional Banks. The path forward isn't easy nor simple, but the status quo alternative is much worse. It's a long journey - start today.